MADDOW: But the right-wing is on fire right now about Shep Smith citing that same information I cited, because I also cited it and therefore it must be false. Read our post again if you must, and look hard for where we implied, or suggested, or said any such thing. We didn’t. If that description was supposed to be a summary of what we wrote (and since this was on screen as she spoke what else could have been intended?) then it’s worse than bullpucky. It’s a lie. I have to rule in $’s favor. I’ve read his post top to bottom, front to back, inside out, upside down, right side up, drunk, sober, stoned, comatose…he made no such allegation that if Shep cited something Maddow cited it “therefore must be wrong”. The only thing $ did was note that Shep coincidentally, or maybe not coincidentally, cited the exact same stat. And I can see no reason why Maddow would come to that conclusion based on $’s post. 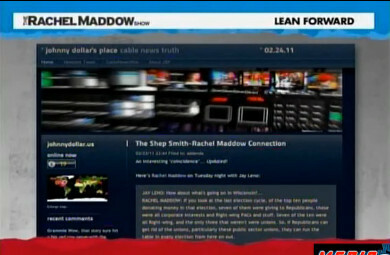 This entry was posted on February 25, 2011 at 12:37 am and is filed under MSNBC. You can follow any responses to this entry through the RSS 2.0 feed. You can leave a response, or trackback from your own site. Thart’s a ridiculously literal reading of Rachel’s point. What everybody implied with Shep using the same stat is that “he’s a liberal liar, just like Maddow”. J$ and Mediaite both lumped him in with her. That’s an inference based upon your interpretation, not a fact based on the evidence presented in the articles. There’s nothing wrong with a literal reading of Maddow’s point because there’s no other factual evidence to go upon. In fact it would be unfair to Rachel to try and construe some other point she may or may not have been trying to make because we have no way of knowing since we’re not mind readers. I don’t agree with $ on a lot, but he was right on this one. He also pointed out how Rachel phrased her allegation one way on Leno, and a different way on her show last night. I was hoping she’d correct the record tonight (didn’t expect her to respond to $ directly), but she kind of dug herself into more of a hole. That’s what she does, my2cents: she doubles down on her lies with snark, sarcasm, and upward inflection. Keith Olbermann taught his MSNBC disciples (Maddow, O’Donnell, Schultz, Uygur) well. Sure, Mike, just group ’em all in together. O’Donnell, specifically, doesn’t even come close to that description. You’re right. O’Donnell and Schultz are angry, but my earlier description fits Rachel and Cenk (perhaps without upward inflection). Well, J$ is parsing it like a lawyer now. And, it’s true that the implication of his original post was not that the information Shep cited must be false because Maddow also cited it. The implication was, if you are paying attention to what that liberal on MSNBC is saying and using the same facts, that’s a problem. Even if the facts were correct (and the facts were correct), it’s a problem because it sounds like something Maddow would say, and frankly they just plain can’t stand liberals and think they are always wrong, and facts that support an argument a liberal makes must be bad facts and shouldn’t be mentioned, I suppose. Of course, there’s no proof that Shep (and/or producers) got this information from Maddow, but it doesn’t matter if they did in my opinion; the information was accurate. The J$ post was thrown out there as speculation and the comments resulting were nearly all people complaining about how they couldn’t stand either one of them. I thought it was kind of shady. Might want to check your facts. Not because you’re liberal. but because you’re wrong.